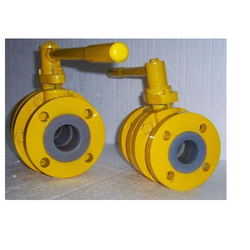 Prominent & Leading Manufacturer from Mumbai, we offer ptfe lined pipe fittings. Where highly corrosive materials are used in any area of chemical process industries. Where product purity is critical. where environmental pollution to be avoided. Where pipe replacement is difficult or impossible. We offer fully lined valve range in PFA/FEP/PVDF or PP as per the requirements in order to provide complete solutions to CPI and related industries for their corrosion problems.